with NO prior organized hockey experience. Having at least some experience ice skating is helpful. Helmet and cage, shin pads, elbow pads, gloves and a hockey stick are required. Hockey gloves are strongly suggested, otherwise lacrosse gloves are ok or heavily padded winter gloves are acceptable. Hockey pants and shoulder pads are suggested if possible. For equipment, you can borrow gear for the weekend from a friend, attend Hanover's Used Equipment Sale on September 18th or contact Stateline Sports about their Learn To Play Package (see below). STATELINE SPORTS : All equipment is available at Stateline Sports in West Lebanon, NH. You may purchase single items or ask about the Learn To Play Package anytime. Please bring your child to Stateline Sports. They will expertly fit your child for all necessary hockey gear. Please note: There will not be a Stateline employee available at the rink on the first day of the clinic. If you choose to keep the gear, at time of equipment purchase a credit card payment will be required. 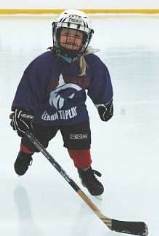 These packages include everything your child needs to hit the ice and reflect a $50 savings. At the end of the clinic if the player opts to continue with HHA, they simply keep the equipment. If the player does not continue, all equipment must be returned to Stateline within a week. For more equipment information at Stateline, please contact Bob Friend at Stateline (603) 298-8090 or email Jon Damren at Stateline’s address is 22 Bridge Street in West Lebanon, NH. From Campion Rink/Sachem Fields, head south on Route 10 for about 2 miles. At the first traffic light (in old West Lebanon) take a right on Bridge Street and Stateline is down the hill on the right next to Portland Glass.